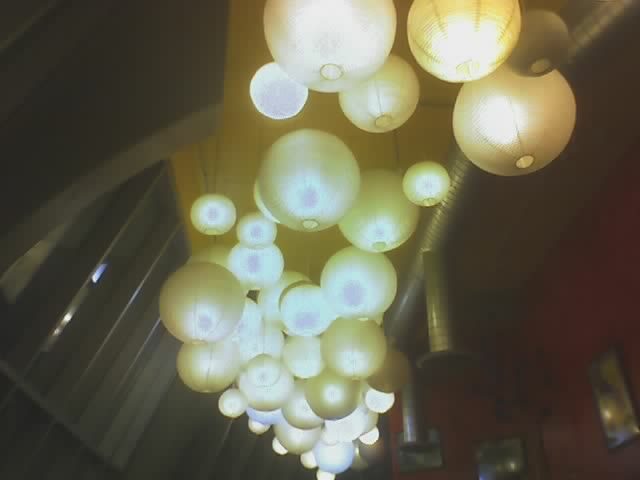 Cafe Ladro, at the base of the bizarre Tower Apartments. Friday. I have a run of TUA today at 11am, so I'm up early for this timezone, trying to finish loading all the changes Jean-Michele and I worked out since Monday's run. I'm feeling swollen with words, which is often how I feel at this stage--its like a pregnancy of the mind. Yesterday we got settled here at ACT--everyone's been really wonderful here on the ground, and we're slipping quickly back into life on the road. Tonight we're going to see Matt Smith's latest solo show, My Boat To Bainbridge. Matt is an monologuist like myself, and I've really enjoyed knowing him over the years--his show My Last Year WIth The Nuns is a wonderful piece of work I saw in 2001 and I still think about regularly. I'm really looking forward to that. Tomorrow there's more theater--Josh Knisely's show Hypnagogia, which just received a great review from the Seattle PI. I've seen Josh's pieces develop over a couple of years, and I'm really happy to get to see a collection of them woven together...from him cooking cake on his bald head with an Easy Bake Oven to Thomas Edison, Pornographer. Great stuff all around. Finally, immediately following the show we're taking in Flaming Box of Stuff's annual benefit, XTL: Xtreme Theater League, where professional wrestling meets performance in a big, drunk, sloppy way. I'm really looking forward to this most of all--I'll be doing the national anthem. Details for that highbrow event are here. It's sunny out. Seattle can be fickle, but when the sun shines you appreciate it like hell. 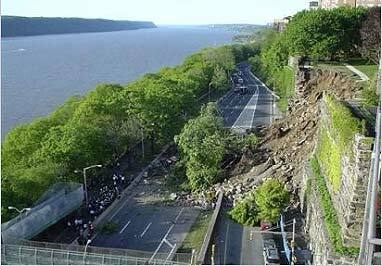 Retaining wall collapse on the Henry Hudson Parkway.